Cut peeled eggs lengthwise in half with rippled vegetable cutter or sharp knife. Carefully remove yolks and place in small bowl; mash with fork. Reserve egg white halves. 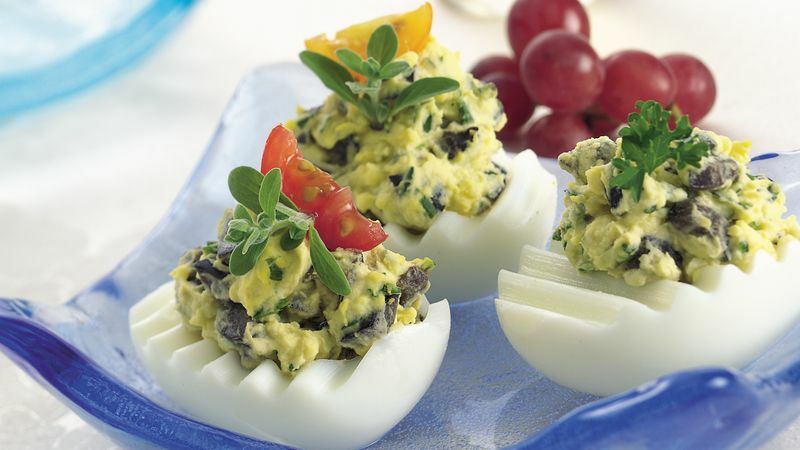 Mix mashed yolks, mayonnaise, chopped herbs, garlic pepper and chopped olives. Carefully spoon mixture into egg white halves, mounding lightly. Cut whole pitted olives into slices; top each egg half with olive slices. Garnish with small herb sprig or leaves. Go ahead and substitute basil for the parsley or marjoram if you like. Don't be tempted to use Kalamata or other specialty olives in this recipe because the flavor would be too strong. The ripe olives are mild enough to add just a pleasant olive flavor without overpowering the egg flavor. Prepare the stuffed eggs up to 24 hours in advance. Refrigerate in a tightly covered container until serving time. Instead of an olive slice, top each egg half with a cherry tomato wedge.